The time has come to be bold and daring. The time has come to take a risk. The time has come to show a little faith, 'cause there’s magic in the night. I’m going to try something new. It might end in ignominious disaster, or glorious triumph, or die somewhere (mercifully? tragically?) along the way. I’m saying this up front: I don’t know how I’m going to do it. I don’t have a plan. I have only an idea: I want to tell you a story. Specifically, I want to tell you the story of the night of December 6th, when Elizabeth and I went to see Bruce Springsteen and the E-Street Band at Jobing.com Arena in Glendale, Arizona. It’s a story that encompasses much more, and much less, than a single night. And it’s a story only I can tell, because, like everything here at thunderstrokes, it’s always as much about me as it is the purported subject. Here’s the thing. The way I’ve decided to tell this story is a little, um, unorthodox. This story will have 26 parts. Well, somewhere along the way I got the idea that it might be possible to tell this story within the framework of the songs Springsteen and the band played during that December concert. By my count, the set list was 26 songs long, so that means 26 parts of the story. I start with the first song, and end with the last. Every song, in order. Little bits of the story get woven into each song. Sound a little coo-coo for Cocoa Puffs? Yeah. Anyway, that’s the challenge I’ve set out for myself. I have only the faintest idea of how I’m going to begin; and there’s a terrifyingly huge chunk in the middle of the concert where, as of this moment, I have no real sense of what I will say or do. Theoretically, if this works, you should be able to read any of the parts, and each one would pretty much stand on its own. Or you could start right here, at the beginning, and read them consecutively. Please don’t ask me for a recommendation; my hands are full as it is. Hopefully, though, by the end you’ll have a pretty thorough understanding of our perspective on the concert and all the things that went into that night, and some that came out of it. That means you’ll also probably know far more than you wanted to concerning my thoughts and feelings about the show, the music, and, of course, The Boss. This is something I want to try now, while it is still a wild, scary, overwhelming idea, before my mind has the time to tame and domesticate (and ultimately shelve, I suspect) this impulse. I want to try it now, without waiting for all the answers to come. Somewhere in my head I keep hearing, Don’t waste your time waitin’. Of course, that might be because I’ve been listening to a lot of Springsteen lately. I have a long track record of playing it safe, of waiting until I’m almost certain of the outcome before ever setting off. That’s true whether it’s writing a blog piece, or living life. I need to push myself. I need to reach into the unknown. I need to walk the line. I need to look down for once, and not see a net. I think I need more practice embracing uncertainty, even if it’s only in writing. So now is the time to start. The concert started late on Thursday, December 6th. The next day, when I went looking online for the set list, I found a website that posted the concert’s actual starting time: 8:18. Almost an hour past the time printed on our tickets. But that night, as we sat in our seats looking around aimlessly or trying to make small talk over the pre-show music emanating from the arena’s sound system, we didn’t know exactly how late it was. My phone died, and Elizabeth left hers in the car, and looking around, there were no clocks to be found. I could have turned to ask a neighbor I suppose, but what good would that have done really, except make us more anxious and upset? It’s not like we were going to leave or anything. As we waited, several technicians clambered up rope ladders like they were being airlifted from a choppy sea. It wasn’t intended to be a performance, there were no death-defying acrobatics or heart-stopping twirls; the workers simply climbed up into the structure of the lighting rig, and disappeared. Still we were appreciative for the distraction they provided. After that, though, there was little to occupy my mind and imagination aside from projecting what the babysitting damages were going to amount to. 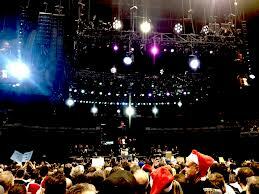 Springsteen concerts are renowned for going long into the night, and that’s when they start on time. I felt like sending The Boss The Bill. Besides, Springsteen was already kind of in the doghouse with us. Well, more Elizabeth than me. We had seen Springsteen once before, in October 1992, following the release of Lucky Town and Human Touch. He played what was then America West Arena (now U.S. Airways Center, soon to be something else I’m sure) in downtown Phoenix. I thought the show was fine, but was dissatisfied, as I always was after concerts there, with the muddy, muffled acoustics inside what was never meant to be anything but a basketball building. I also remember reflecting over the evening and wondering mildly what it was about a Springsteen concert that was supposed to make them legendary. Elizabeth, on the other hand, was ticked. “That show sucked,” she repeatedly told me in the car on the way home. “That was a total rip-off. He didn’t play Badlands, or Rosalita. The band didn’t sound anything like the E-street band (largely because it wasn’t). He didn’t even play Hungry Heart.” She stayed angry, and for many years after that night refused to even entertain the idea of going to another Springsteen concert. I think she could’ve overcome all the other shortcomings she saw in the show; it was the absence of Hungry Heart that turned her into an unforgiving and implacable critic of the experience. As I sat there half-watching her, I realized that I didn’t know why she changed her mind about seeing him again. Maybe twenty years of harboring a grudge was enough. Maybe her personal statue of limitations finally expired. Geez, most criminals are safe from their crimes after only seven. I love my wife deeply, but I could never support her for sheriff, or a Supreme Court nomination. We sat there still longer, doing nothing. Our seats were in the upper level, at the opposite end from the stage. As the minutes wore on, I suddenly began to feel like I was having trouble breathing, as though we were in a sealed container, and the crowd was using up all the oxygen. This happens to me sometimes, usually when I am in an enclosed environment and have too much time to think about it. It used to happen to me at church frequently. I took some long, deep breaths, told myself we weren’t really in a sealed container, the air’s just a little warm and stagnant, that’s all, and in this way talked myself through it. Finally, the lights went down. 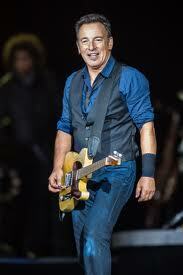 When Springsteen came onto the stage, he was alone and unarmed, holding only a guitar to defend himself. He started to say something that I first thought was meant to be a joke, or some kind of self-effacing comment about how he came up with this just for us backstage, but his voice was kind of low and husky, and I wasn’t sure I heard him correctly. Is it just me, I thought, or is he sounding more and more like Bob Dylan? The words were so simple, I thought perhaps Springsteen wasn’t kidding after all, and he really did just come up with the song backstage, and that’s why he was late. Hold it, I thought. Did he just write that, or did he just rip off a Hallmark card? And who needs an hour to plagiarize a birthday card anyway? I looked over at Elizabeth. She half-grimaced doubtfully and shrugged, which was a much more favorable reaction than I expected. It just didn’t sound like Springsteen to me. Okay, that was nice, especially that part about the stars scattering a shining crown, and the darkness of the morning and the sky struggling to light. As the first song came to an end, I was confused. For one thing, I wasn’t sure I even liked it. And it seemed a strange way to open a rock-n-roll show, with such a very calm, gentle, warm hug of a song. I’m no expert, and certainly not one to question Springsteen’s creative decisions, but I think we have to admit these are things not typically associated with the genre. It also bothered me that I couldn’t tell after the first song what kind of concert we were in for. And on top of all that, I was afraid to look over at Elizabeth. In the days and weeks following the concert, though, I find that it is Surprise, Surprise that has lingered most in my head. Not Born to Run, not Prove It All Night, not Tenth Avenue Freeze-Out. Just this simple little tune, with its simple little words running in a near-continous loop in my head. I sing it while I’m in the kitchen, while I’m emptying the trash, while I’m walking from one room to the next, while I’m getting the kids ready for school. I sing it until I start getting exasperated looks from my daughters, and then I stop singing it in front of them, and wait until I’m alone. Except I keep singing ‘light’ instead of ‘love’ without realizing it. I don’t even know what that line means, especially relative to the previous three, but it doesn’t matter. There’s just something about it that’s graceful, peaceful. There’s something in it that I can’t help responding to, and I find that I’ve now developed a real fondness for this song. I guess The Boss knew what he was doing after all. Thanks, Carolyn. I am too. I can't wait to see what I write. perhaps your inclination to sing "light" instead of love could be connected to the song "Shine" by Collective Soul. They sing the line "Heaven let your light shine down." Maybe your mixing the lines unintentionally. In any case, both songs are great, especially when performed live.